When the zombie apocalypse finally hits, blasters alone won’t be enough to keep the brain-hungry hordes at bay. So with its new Zombie Strike Brainsaw Blaster, Nerf has managed to incorporate a working chainsaw with a kid-safe foam blade. Chainsaw blasters have long been a staple of the post-apocalyptic landscape, but in order to be safe for kids, toy versions have always relied on imagination to make them work. In other words, they never do. But in addition to firing eight foam darts from barrels on either side, the $30/£21 Brainsaw Blaster has a working foam chainsaw blade that actually spins. As for how your kids plan to use it during playtime, you probably don’t want to know. 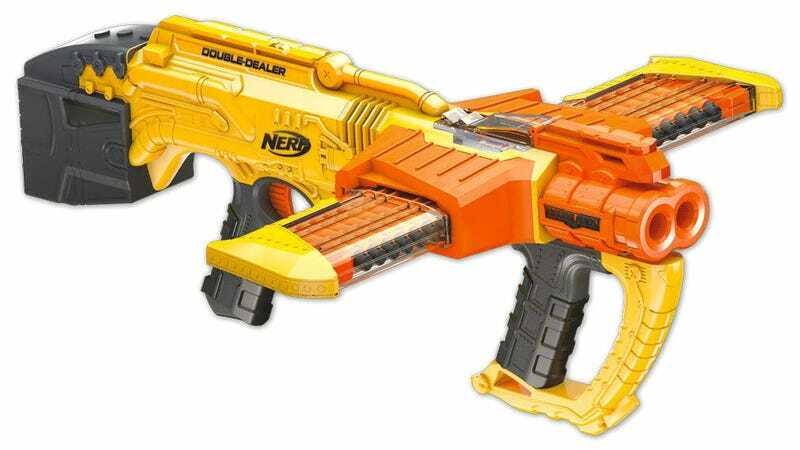 And for those times when you just want to blast zombies away from afar, ahead of Toy Fair 2016 in New York Nerf has also revealed its new Doomlands Double-Dealer Blaster. Available come this fall, just like the Brainsaw, the Double-Dealer features two magazines sticking out of either side of the $40/£28 blaster that each hold 12 darts. But to make the weapon twice as dominating in battle, it also has two barrels that fire darts simultaneously. So you can easily take down two targets at once, as long as they’re standing right next to each other—it could happen!